The Ridgid R4210 checks off the major boxes you'll need on a job site miter saw while maintaining their focus on creating high-value tools for Pros. When considering tools, I always look for the biggest bang for my buck. That is, I like for my tools to serve multiple purposes, work on multiple materials, etc. My go-to miter saw for the past several years has been a trusty DeWalt 12” saw, which will cut just about anything. Stepping down from this giant to the more portable Ridgid 10″ Dual Bevel Compound Miter Saw was definitely a change for me, yet a surprisingly welcome one. Ridgid has once again worked hard to incorporate the newest designs and technology into this saw. Let’s take a few minutes to see if this saw is right for your job site. 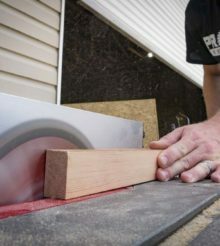 Before we get too deep into the review, I think it’s important to touch on the difference between “bevel” and “miter” cuts in order to understand the full capabilities of the Ridgid 10″ Dual Bevel Compound Miter Saw. The simple version is that miter cuts change the horizontal angle while bevel cuts change the vertical cutting angle. Doing both at the same time gives you a compound cut. Setup: Setup is straightforward, with very little assembly required out of the box. The saw comes with a multipurpose, wide-tooth blade, which is easy to install with simple hand tools. Initial Quality: Both the metal and plastic pieces of the saw are of excellent quality. I don’t have any concerns at the outset. Portability: An additional carrying handle on the rear of the saw arm makes moving the saw a breeze. Trigger Safety: The trigger switch features a standard safety that gives it a separate action to avoid accidental startup. With minimal storage space in my work trailer, I choose to stow my saw with the saw arm and blade beveled to the maximum distance. This decreases the overall height of the saw and allows it to sit comfortably on the shelf. Some accessories are easily removable, such as the adjustable fences and the friction pad. I usually store these separately as the saw doesn’t bevel down completely with the fences in place. Ridgid advertises their 10” saw as able to “handle any job thrown its way”. While there are some capacity limitations to that claim, Ridgid has a good reason to boast – there’s no belt driving the blade. With a direct drive, you won’t see the slight hesitation or power loss over time that you do with a belt that loosens. Having used a 12” saw on my job sites for as long as I can remember, I had no qualms about throwing the Ridgid unit to the test right away on a deck project that I was in the middle of. I can say that, for its size, this saw has some serious power thanks to the direct drive. With the 15-amp driving 4000 RPM, it cuts effortlessly through a variety of materials, including treated lumber and PVC for pre-fabricated railings. The saw is capable of cross-cutting a 4 x 4 in a single pass, but it’s a close shave. That’s something to keep in mind as your workday progresses and sawdust builds up. Pro Tip: Watch the amount of sawdust that builds up on the rails and around the saw over the course of the day. When you’re cutting close to the maximum capacity, it can block the blade from going all the way back or dropping all the way down. Just give it a quick wipe down to avoid any issues. The Ridgid 10″ Dual Bevel Compound Miter Saw includes a standard bag that attaches to the dust collection port for the smaller jobs. For larger jobs, most standard wet-dry vacuums will fit into the dust collection port as well. Dust collection is about as good as you can expect on a miter saw, but better if you connect a vac. The detent ensures that the saw stays locked in place while you make miter cuts. There are some cheap saws out there that you can knock out of angle. While I didn’t expect Ridgid to fail in this category, it’s nice to confirm its success. The saw also comes with a removable friction pad to hold stock in place, although I find it only has an effect on the lightest pieces of trim. While this isn’t a big deal as a job site saw, you’re much better off using the saw in conjunction with a stand that supports and levels the material over a longer distance for serious carpentry. Ridgid goes with a shadow cut line indicator, which is the preference among most of the Pro Tool Reviews team. There’s no calibration to worry about since the shadow doesn’t lie about the blade’s position. At $349, the Ridgid R4210 settles in nicely to Ridgid’s line of affordable, capable tools aimed at Pros. I find that finish carpentry fits really well into the Ridgid’s wheelhouse. This saw cuts beautifully through all types of trim with incredible precision. Ridgid includes instructions for zeroing in the saw before use, however, my cuts were accurate at a 32nd of an inch, right out of the box. This precision, coupled with the ability to bevel up to 70˚, makes this saw ideal for joining all types of trim, especially crown molding. The saw features all of the regular stops ranging from 0 to 67.5˚, both left and right. I really like what Ridgid has done in the 10″ miter saw class. The construction is nice and it boasts a large amount of power for such a compact unit. For the serious woodworker, trim carpenter, or anyone looking to cut smaller material, this saw definitely merits a second look. At 47 pounds, it’s very portable and it couples nicely with Ridgid’s rolling stand. This makes for a nice combination on any job site or workshop. As I talked about previously, you need to know your limitations with a 10″ saw; if you plan for this saw for your “end all, be all” miter saw, you might be disappointed. While I’m not quite ready to give up my 12” model, the 10″ Ridgid R4210 will stay on the trailer for my trim work and small jobs. I bought a couple of these and both had upper fences that “leaned” back and were not in line or square with the lower fixed fences. Did you notice this on yours? Isn’t this a huge issue with respect to cutting nested crown? Trying to decide between the 10 inch and 12 inch Ridgid. They’re roughly the same price. Seems like pros/cons for each are a little different. I’m a weekend warrior with a couple of outbuildings that need occasional work. I’m a very novice woodworker. I have an old Dewalt 12 inch (non-sliding, single bevel) that works fine but I’d much prefer one that slides. So I’d likely just sell this one on Craigslist. I already have the Ridgid stand. This looks identical to the Craftsman 10 inch compound miter saw. Or was it compact miter…can’t remeber. Assuming there are no issues with blade wobble, it looks like Rigid hit a homerun with this.